Workers are getting ready to apply new stucco, repair roofs, improve heating and cooling, change the landscaping and more at the Palace of the Governors, a 400-year-old National Treasure in the heart of historic Santa Fe. 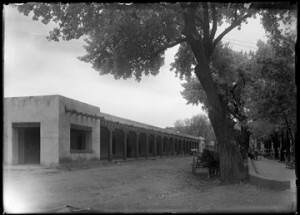 Begun in 1609–1610 as the seat of Spain’s North American colony, the Pueblo Revival building became the flagship of the state’s museum system in 1909. In recent years, it has drawn preservationists’ fears, most critically because of its 1970s cement stucco on the interior courtyard’s wall. Now, thanks to a $400,000 infusion from the Department of Cultural Affairs and another $680,000 from the state Legislature’s recent session, that water-trapping stucco will be stripped off and replaced with a breathable lime plaster. Stucco around the rest of the building will be patched up, workers will install new roofs above the Palace gift shop and Meem Community Room, and the Palace’s capricious heating-and-cooling system will be tied into the New Mexico History Museum’s more reliable one. Other repairs include replacing approximately 18 viga ends along the Palace Portal, fixing whatever damage is revealed when existing stucco is peeled off, and smoothing the rumpled brick sidewalks on the sides of the building to make them wheelchair-friendly. The $680,000 allocation will help pay for even more work at the New Mexico History Museum, including replacing doors that have settled poorly and, in some cases, contributed to a problem with rain leaks.